Prepare your child for his first visit to the dentist. The first visit to the dentist shouldn’t be a scary time for your child. Remember, your child doesn’t have any negative feelings toward a dentist, and do not associate the trip as something to dislike. There are three simple things you can do to help your child prepare for the experience. 1. 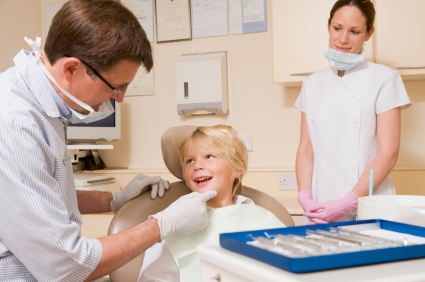 Reassure your child that you go to the dentist, too. Show your child your own teeth. Show how the teeth in your child’s mouth are similar to those in your mouth. Go over the dental health practices you’ve already been teaching your child, reviewing why it is necessary to take care our teeth. Make sure to emphasize the importance of a healthy mouth. It always helps to know that there are others like us, and your child is no different. He or she benefits from seeing that mom and dad have teeth and that a regular trip to the dentist is a visit they make, too. Simply allowing your child to identify and be just like mom and dad is a great way to build confidence. 2. Prepare your child for who will be at the dentist’s office. Just as we appreciate an overview of what’s coming, your child will benefit from hearing about what he or she can expect in the dentist’s office. Talk about the facility itself, and the people who work at the front desk. Perhaps you’ll talk about the special chair and the lights, and the noises that are common in a dentist office. Mention that there might be other patients waiting to see the dentist, too. Discuss the hygienist, and of course, don’t forget to talk about the dentist! The goal here is to help your child become familiar before they arrive so that the focus is on identifying or recognizing what you’ve made familiar instead of being scared by the noises and lights and people. 3. Tell your child what will happen at the dentist’s office. Just as knowing who will be there before arriving helps a child feel less fearful, being honest about what will take place is necessary, too. Nothing is worse for a young child than being told an experience will be all pleasant when, in fact, there might be moments that could be scary if it is not known why they are happening. Tell your child the truth, but in terms that don’t terrify. There might be cleaning, scraping, and fluoride treatments. Mention the squirt hose, the sucking straw, and the spinning toothbrush. Talk about the order these things will be used, why they will be used, and why it’s a good thing that they are being used. Be sure to tell your child that you, too, have experienced this and that it helps keep you and your teeth healthy. These three tips are based on the assumption that you’ve already instilled the importance of a healthy mouth in your child. New (and sometimes scary) experiences are easier to have if your child knows it is something that will help her and that you follow the same practices for your own teeth. Let’s build a good foundation for future dental health!